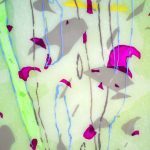 Graduate student Sydney Ewerth will present her Master of Fine Arts thesis exhibition, This Then This, March 1-10, 2017, at the Sella-Granata Art Gallery in Woods Hall on UA campus. The public is invited to an Art Night reception for the artist, Thursday, March 2, 4-6 p.m.
Atlanta native Sydney Ewerth received her BFA with a concentration in sculpture and ceramics from Augusta University (formerly Georgia Regents University) in Augusta, Ga. During her candidacy for the MFA at the University of Alabama, she has taught and assisted classes on various topics in ceramics and drawing. 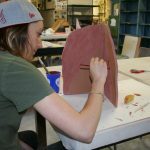 In the summer of 2016, she attended a two-week ceramics workshop at the Oxbow School of Art in Michigan. She also apprenticed under artist Amy Pleasant. 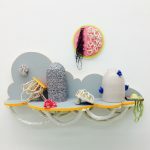 In 2015, Ewerth was juried into five ceramics exhibitions from New York state to Louisiana. She won an honorable mention in the Lux Center for the Arts’ Mug Shots Juried Exhibition in Lincoln, Nebraska. 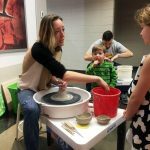 She is a member of the National Council on Education for the Ceramic Arts (NCECA) and UA’s Crimson Clay Club. 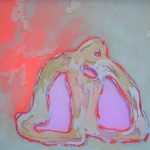 Ewerth’s art website is here. 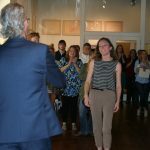 Funding support for the Sella-Granata Art Gallery comes from the UA Department of Art and Art History. Admission to the gallery is free. The gallery is located at 109 Woods Hall in the heart of the UA campus on Woods Quad. Hours are Monday through Thursday 10:00 – 4:00 p.m. Information about visitor parking is available here: http://bamaparking.ua.edu/visitor-information/. Parking is free on campus in a legal space after business hours. Contact the gallery at (205) 348-2783 or go to http://art.ua.edu/gallery/sgg/.